Amid his stops in Indonesia and Vietnam, questions remain over the direction of the Trump administration’s Asia policy. WASHINGTON, D.C. — On Sunday, U.S. Defense Secretary Jim Mattis began a weeklong trip to Southeast Asia taking him to Indonesia and Vietnam. Though this is just the latest of a series of trips that Mattis has taken to the Asia-Pacific, this particular voyage is notable not just for the range of defense issues that are expected to be addressed with his counterparts, but also the lingering questions for U.S. President Donald Trump’s defense policy in Asia that still persist in the region. As I’ve written repeatedly in these pages, though the Trump administration has displayed some degree of continuity with what we saw during Barack Obama’s presidency, there have also been some changes that Mattis and other U.S. officials have been emphasizing in terms of its Asia policy on the defense side, including the relatively greater emphasis on North Korea, a blunter tone on China, and a greater attention to boosting U.S. military’s eroding capabilities in the region (See: “What Mattis’ Shangri-La Dialogue Speech Revealed About Trump’s Asia Policy”). This is apart from some of Trump’s own worrying moves beyond the defense realm, such as the withdrawal from the Trans-Pacific Partnership (TPP) trade pact. 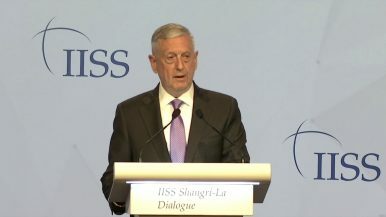 The administration’s first National Defense Strategy (NDS), released and previewed by Mattis last Friday before his ASEAN trip, built on these broad outlines which were also seen in the National Security Strategy from December 2017, be it elements of change such as the heavier focus on great power competition with China relative to counterterrorism, as well as those of continuity with expanding Washington’s network of alliances and partnerships in the Asia-Pacific (See: “Trump’s Indo-Pacific Strategy Challenge”). Mattis’ trip to Indonesia and Vietnam takes him to two partners that would be an important part of the Trump administration’s effort to build out what the NDS characterizes as a “networked security architecture” to “promote a free and open Indo-Pacific.” Indonesia – the world’s largest archipelagic state and biggest Muslim-majority country – is a significant actor in Southeast Asia and an important partner in addressing challenges ranging from maritime security to Islamic extremism. Vietnam, meanwhile has moved briskly from the end of the Cold War from a former U.S. adversary to a closer U.S. partner, including in the defense domain (See: “U.S.-Vietnam Defense Relations: Problems and Prospects”). The Trump administration, to its credit, has recognized this from the outset and quickly began strengthening defense ties with both countries since it took office (See: “Trump’s Indonesia Challenge Begins With Pence’s Visit”). And in addition to the advances both sides will publicly disclose during Mattis’ trip, there are other developments we are expecting in these two defense relationships in 2018, such as the visit of a U.S. aircraft carrier to Vietnam in yet another major first for the relationship. But amid the attention given to opportunities in these relationships, it is also important to keep in mind the limitations that remain. Both Indonesia and Vietnam, for a different mixture of reasons, have desired a close but not too close relationship with Washington as part of their wider foreign policy, and that remains true today. That explains why progress in certain areas – be it on maritime security in the case of Indonesia or weapons sales in the case of Vietnam – remains much slower to actually concretize despite continually being emphasized as area for further collaboration. Policymakers in Jakarta and Hanoi also remain profoundly concerned about some of the administration’s moves beyond the defense realm, be it the TPP withdrawal (which Vietnam was part of), Trump’s travel ban, or the recognition of Jerusalem as Israel’s capital, which only fuels anti-American sentiment in Indonesia and complicates the wider bilateral relationship as decisions of that ilk have done before. Even though these decisions coexist with other promising foreign policy moves, they also reinforce the daylight that remains between Trump’s worldview and the oft-cited bipartisan consensus on U.S. Asia policy, which includes a general support of free trade, a regard for democracy and human rights both at home and abroad, and an acknowledgment of America’s traditional leadership role in the world and the sacrifices that entails. Furthermore, though both countries have fallen victim in some cases to Chinese assertiveness – be it via its militarization in the South China Sea or its attempts to strongarm its neighbors and restrict their autonomy – there are still significant reservations among part of the governments in Jakarta and Hanoi to be enlisted as part of an effort to contain China. This is especially the case given the unpredictability we have seen during Trump’s first year in office as well as the fact that so little is still known about its overall domestic and foreign policy, let alone its Asia approach. So even as we see Mattis and the Trump administration continue to seek greater cooperation around various issues with Asian states this week and for the rest of 2018, it is important to keep in mind that those states will be seeking to answer several questions of their own with respect to the administration’s broader regional strategy as they assess their own options not just in ties with Washington, but their own wider foreign policy as well.